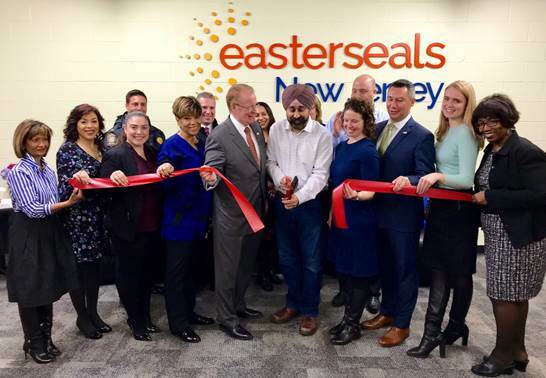 In a ribbon cutting on Wednesday, March 20, Mayor Ravi Bhalla, Councilwoman Emily Jabbour, and CEO of Easterseals New Jersey Brian Fitzgerald opened Easterseals’ new Hoboken location. Easterseals, a nonprofit organization offering supportive services to at-risk populations, is now open in the Harlow building at 1335 Clinton St. in uptown Hoboken with the support of the City and Hoboken’s Homeless Task Force. Hoboken’s Homelessness Task Force was initiated by Bhalla and the city last year, with the aim of compassionately addressing homelessness in Hoboken. The opening of Easterseals is part of the task force’s “prevention” strategy of offering services to at-risk communities. At the Hoboken Easterseals location, trained staff offer services including Easterseals Senior Community Service Employment Program (SCSEP), a work-based program for seniors, and the Supported Employment (SE) program, which offers job training and employment for people with disabilities. Each program will use the Hoboken site for administrative tasks and meetings with program participants in order to help them achieve their employment goals. The Hoboken location is open Monday through Friday from 8 a.m. to 5 p.m.
For information regarding Easterseals New Jersey and its statewide disability services, contact 732-257-6662 or visit www.eastersealsnj.org or www.facebook.com/eastersealsnj.